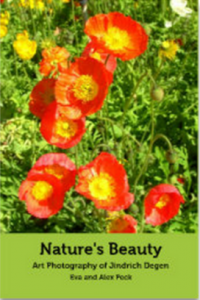 Our recently published book, Nature’s Beauty features digital photos of Jindrich (Henry) Degen. They were taken in south-east Queensland, near Brisbane, Australia, over the last decade or so. Many of the photos, arranged under ten categories, have an artistic flair. Inspirational quotations complement the artistic-photographic beauty. A respected local artist, Jindrich (Henry) Degen has taken photos in natural settings from the perspective of the artist as a photographer. Indeed, quite a few of Jindrich’s artistic photos have also become the subject of his paintings. In Nature’s Beauty, Jindrich continues his exploration of artistic photography featured in his first photography book, Floral and Nature Art. This publication again shows Jindrich’s keen imagination with which he perceives meaning in ordinary objects of nature, thereby giving many of his photos an artistic flair. While Jindrich only purchased a digital camera a few years ago, he is no newcomer to photography. Since his youth, long before automatic camera setting and in-home photo printers, he has taken black and white photos as well as developing, printing and enlarging them. Presently, Nature’s Beauty has limited circulation, but it is available to purchase. To preview or buy the book, click on the above link or the image. For Jindrich Degen’s other photography book and online photo gallery, as well as his art and art books showing his numerous and varied art forms, visit www.henrydegen.com. See also Floral and Nature Art. Feel free to leave a comment or book review here.